Camphor is a special type of chemical, which is found from special plant. It is obtained from special distillation process. There are three type of camphor such as Japani, Bhimseni and Patri. Camphor is used in worship, medicines and fragrance. In Indian rituals, camphor is widely used in Aarti. Camphor fragrance increases the concentration level and its fire removes cough and bile. The intake of camphor eliminates pain but its overdose creates poison and intoxicant. Keep camphor in broad vessel. Light fire in it. Then twist it in front of the god or goddess. Keep fire near to your heart or above it. Take camphor’s fire with your both palms and apply it on your face and head. Camphor oil is beneficial in blood circulation. You can apply camphor in neck pain or spinal pain. It is also used in inflammation, acne and oily skin. Camphor can be used in arthritis pain. Put some drops of camphor oil in bathing water. It removes negative energy and laziness. Camphor oil is also used to remove cough from the chest. 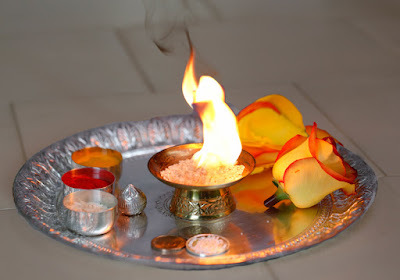 Keep camphor on fire in vessel and spread its fragrance. It removes depression, negative energy and Vastu dosh from home. Mix rice or sandalwood in camphor and apply it on your forehead or throat. It increases attraction and decreases anger. Remedy: Do not keep Ganesha image outside the entrance gate of home. It increases problems and poverty.